actively involved in the healing process. "It gives us a chance to physically work through problems." A Three Willows client said he has been having emotional troubles, relationship issues and anxiety since returning from Afghanistan. He wanted to try something new because other forms of therapy didn't seem to be working for him. Learning Association (EAGALA) has been training and certifying individual and group facilitators for a number of years. Our team has been involved in equine therapy with individuals and groups of all ages and with a variety of issues. 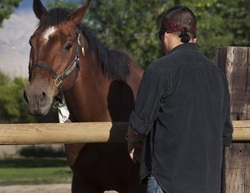 Participants learn about themselves and others by taking part in sessions with the horses and staff and discussing what might be happening in every day life . EAP is a powerful and effective therapeutic approach with an incredible impact on behavioral issues, ADD/ADHD, substance abuse, grief & loss, communication needs, PTSD, and relationship needs. "No man is an island"...you don't have to face the problems alone.